The growing demand for organic fruits and vegetables represents a robust, foundational transformation in our country’s food system. What was once a minor trend is now a mainstream shift that is driving changes for consumers and growers alike. 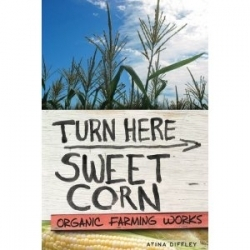 Organic farmer Atina Diffley provides a valuable, compelling look inside this movement. She delves into what it’s like to be driven by a passion for sustainability and soothed by a connection to the land, while also describing the challenges that organic farmers face in today’s economic climate. Diffley and her husband, Martin, founded one of the first certified organic produce farms in the Midwest, a now-sizeable business called Gardens of Eagan. Before they grew the enterprise, they faced the devastating loss of Martin’s fifth-generation family farm (which was once marked only with the sign “Turn Here Sweet Corn,” giving the book its title), as they watched suburban development encroach on what had once been beautiful, fertile farmland. Later, the pair went through an even more grueling event when their land was under threat of eminent domain by crude oil driller Koch Industries. As they fought the company and battled the farmers around them who sprayed toxic pesticides near their land, the Diffleys became political activists. Their never-back-down stance helped to change the laws about protection of organic farms and gives Diffley’s memoir a David vs. Goliath spin that’s hard to resist. A pair of feisty, dedicated farmers staring down one of the world’s largest companies—and getting Goliath to blink first—is the perfect ending to a heartfelt tale of Diffley’s journey to find her sweet corn. Before she became such a force in the organic farming movement, Diffley endured her share of sorrows. After growing up on a farm, she ran away as a teen and ended up in an early marriage, also enduring a long stint as a migrant worker. Pregnant and unhappy, she pondered leaving her abusive union, but felt too trapped and emotionally weakened to take the leap. Not surprisingly, she writes about dry, bleached landscapes or sour rain when describing the unhappy times in her life, but once she meets Martin and they find a farm together, her language is often lush and sensual. It’s as if she transitions from dry pit to ripe peach, without losing any of her keen observational power in the process. Beginning farmers will find a goldmine in her thoughts on entrepreneurship and can learn much from the missteps she describes. Equally alluring are her riffs on farm living, which mix humor with heartache in just the right measure, without veering into overly romantic imagery or cynicism. Despite the current spate of farm-based memoirs, she captures farm life in a way that’s unique and fresh. Throughout the memoir, even in the midst of hailstorms, droughts, and a killer lawsuit, Diffley possesses a blend of strength, faith, and ferocious passion. She’s not afraid to articulate the pain and frustration that can come with farming. She holds on to her dedication by a thin, wispy thread that seems to fray at the worst moments but, thankfully, never breaks. She believes in a spiritual connection to the soil and in a food system that has the power to bring community together. By offering a look inside her own experience, and often her own heart, Diffley creates a multifaceted, powerful, and compelling memoir about trying to live organically.